The maltreated dog, with a broken back, crawls over to the young woman. She can’t just leave him there. Kiara Ijzendoorn and her family, from the Netherlands, were on holiday in Crete. While driving down a deserted street, they suddenly hit the brakes. There was a dog lying in the middle of the road. As the family got closer, it became clear that the animal was in a pitiful state. "His leg was completely paralyzed. He had a large swelling on his back, that was his broken spine," Kiara remembered. "We stopped the car, so he could crawl out of the way, but he just lay there." Kiara found out that the animal lived in an abandoned barn nearby and it appeared that someone had purposefully caused his injuries. She felt so sorry for him that she felt an overwhelming urge to help the poor creature. Over the next few days, she kept going back to the barn to feed the dog, who had been close to starvation. She calls him "Fos," the Greek word for "radiance" or "light." Every time his new friend came to visit him, Fos couldn't contain his joy, despite all his gruesome injuries. He was such a loving animal that Kiara knew she couldn't simply leave him behind. She took Fos to the local animal welfare organization and officially adopted him there. 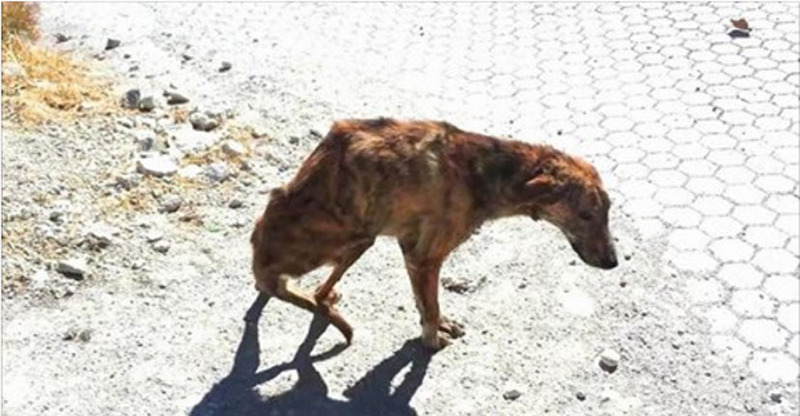 He was examined by a veterinarian, who confirmed that he had been cruelly abused. For the first time in his life, he was properly taken care of and a few days later, Fos was on a plane flying to the Netherlands together with his new family. Today, he is still recovering from his back injury. "He can walk better, and the swelling is not as bad," said Kiara. "He's still afraid of old men and cats." If Kiara and her family had not stopped on the deserted country road for the poor, helpless bundle, she never would have met and learned to love her new best friend. Lucky for Fos that Kiara is such an attentive and compassionate individual!